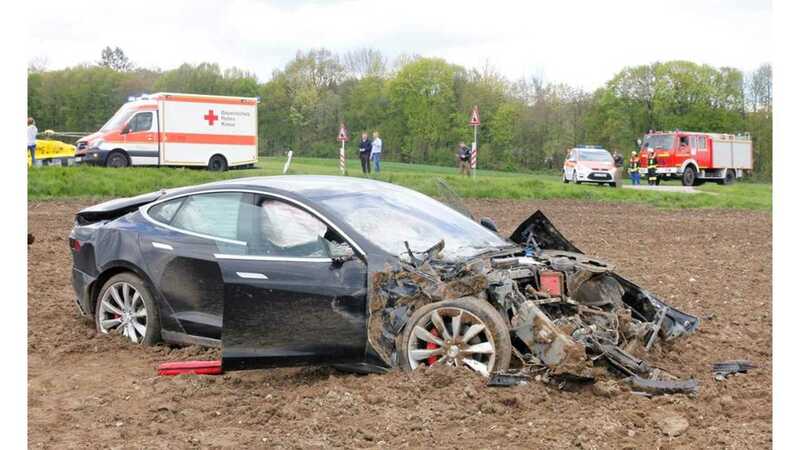 German website Merkur (also a Munich-based newspaper with circulation of nearly 300,000) published a post on a crashed Tesla Model S.
Details are somewhat sparse, but the driver was an 18-year-old female and four other occupants (all between the ages of 18 and 19) were onboard. The Model S belongs to the father of the driver. According to police reports, the accident occurred last Wednesday when the driver lost control of the Model S while negotiating a left-hand turn at a high rate of speed. The car left the right side of the road and then overturned before landing back on its wheels and coming to a halt. Three paramedics, two rescue helicopters and four ambulances were deployed to the scene. "The five occupants were able to free (themselves) from the vehicle itself, but some had serious injuries. The front seat passengers (including a female driver and male from Pullach) along with one in the back seat (from Wolfratshausen), sustained heavy, but not life-threatening injuries and were flown by rescue helicopters to Munich clinics." "(Two others from Starnbergerin and Gautinger) who were sitting in the back seat sustained medium injuries were transported to the Bavarian Red Cross in Wolfratshausen." The Model S was totaled, but all five occupants survived, which is all that matters. The Model S did its job in protecting those within, even in this extreme crash. More images via source link below.